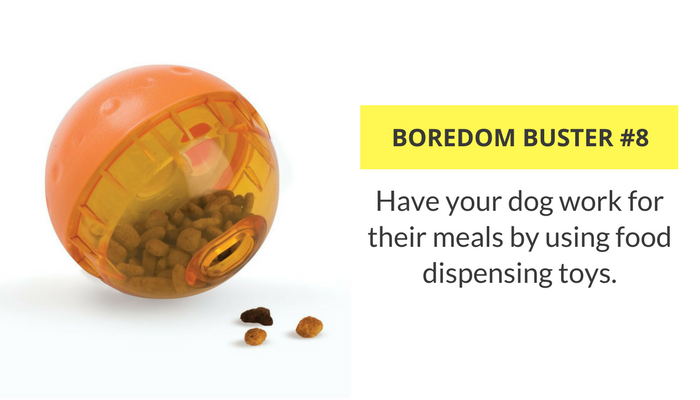 Looking for some easy ways to keep your dog busy? Keeping your dog entertained can be a challenge. And trying to come up with new ways to keep your dog entertained can be more exhausting than actually getting up and doing it. To help you out I’ve put together a list of 33 simple ways to keep your dog busy indoors. Bored dogs get into trouble. We’re their main source of entertainment, so if we don’t give them stuff to do they’ll come up with activities of their own — and that’s when we end up with chewed up shoes and curtains. By playing with your dog a few times a day you can decrease the likelihood of them developing destructive habits such as excessive barking or chewing. With help from my dog Laika we’ve come up with a big list of fun indoor activities for dogs. So if you’re looking for some indoor games to play with your dog you’ve come to the right place. Here’s a list of 33 ways to keep your dog busy indoors. Grab some treats and have your dog watch as you place them around the room. Give your dog the cue to “find the treats” and encourage your dog to pick them up, remembering to praise them every time they find one. After your confident that your dog understands what “find the treats” means you can making it a bit more challenging. Have them stay in another room as you hide the treats, and start hiding them in spots they have to sniff out such as under a rug. The shell game is a simple problem solving game for dogs. To play the shell game with your dog let your dog watch as you place a treat under one of three cups. You then shuffle the cups around and encourage them to ‘find the treat.’ The shell game gives your dog plenty of mental stimulation, and helps them work on their problem solving skills. If your dog’s toys are kept in a container you can teach them to put their toys away. I know it sounds weird to teach your dog to clean up after themselves, but it’s actually a lot of fun. Teaching your dog new skills boosts their confidence, and it’s a great way to give them more mental stimulation. If your dog already knows “drop it” have them pick up a toy and give them their drop it command once they’re standing over the container. Praise them like crazy, then rinse and repeat. Eventually with consistency you’ll have a dog that will be able to clean up after himself. 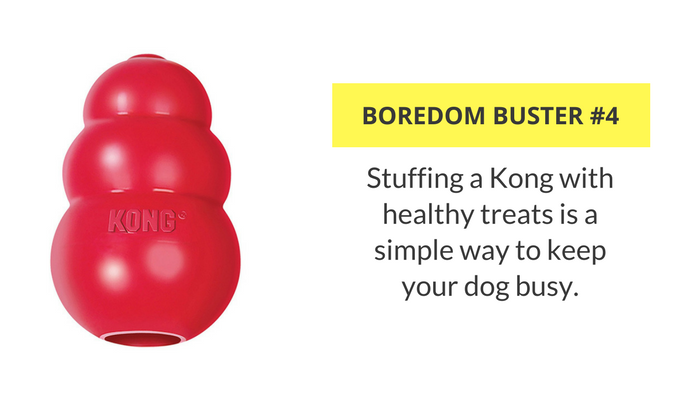 Stuffed Kongs are my favorite when it comes to relieving dog boredom because they’re easy to prepare and will keep your dog occupied for a long time. If you want to keep your dog occupied for awhile try stuffing a Kong with their favorite treats. You can freeze some peanut butter or broth inside, or just put some treats in there and give your dog something to work for. 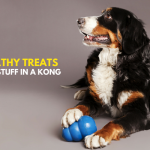 If you’re not sure what to use here’s a list of 39 healthy treats that are great for Kong stuffing. Using a stuffed Kong is a great way to keep your dog busy while you’re at work. Put your stuffed Kong in the freezer overnight and give it to your dog in the morning as you’re leaving. A frozen Kong will last 30+ minutes for most dogs — much longer if your fill it completely. I love using classic Kong’s because they’re nontoxic, indestructible, and dishwasher safe. If you’re looking for a great Kong alternative that’s just as durable check out the West Paw Toppl toy; they come in large and small sizes, and they’re just as easy to clean as a Kong. Stuffing a Kong is an easy way to keep your dog busy & entertained. Playing a game of tug of war is one of the best ways to engage in meaningful play with our dogs. It’s a great way to mentally and physically exercise your dog. And since it doesn’t require a ton of room you can play it indoors. And contrary to what some people say playing tug will not make your dog aggressive, and letting them win will not make them dominant. Letting your dog win just makes the game more fun for your dog, and it will encourage them to play more. Dogs that play tug with their owners have been found to be more obedient and have higher confidence. Dogs love having a job to do, even if it’s something as simple as fetching you your slippers. You can make them feel even more useful by teaching them the names of some items you wouldn’t mind having retrieved. If you want to impress all of your friends teach your dog to fetch you something from the fridge. When teaching your dog to open the fridge tie a towel around the handle so it’s easy for them to pull open the door. And if you’re feeling like a superstar you can teach your dog to help out with daily chores. To keep my dog busy on rainy days I love using interactive games such as tug, find the treats, puzzle games and fetch. Interactive games are an easy way to give your dog plenty of mental stimulation, and they can help cut down on problem behaviors such as excessive chewing or barking. But take it from me; if you’re going to play fetch indoors use a lightweight ball to avoid breaking all of the things. (lesson learned) A game of tug is a lot of fun for dogs, and it’s a great way to increase your dogs manners and impulse control. It’s also a pretty good workout. Minute for minute it’s one of the more physically demanding games we play. We give our dogs a nice comfy life – they get a warm bed, lots of attention, and their meals for free. But our dogs were bred to work alongside us, many of our dogs are missing out on some mentally stimulating activities. One of the easiest ways to challenge their minds is to make them work for their meals. You can make your dog perform some tricks before he gets his dinner, or you can have them eat from a food dispensing toy. Start by playing with one specific toy and giving it a name while you do. After some practice & praise your dog will assign that verbal name with the chosen toy. Once your dog has learned that specific toys name you can test their skills by seeing if they can pick it out among their other toys. Dogs have the ability to learn hundreds of words. Start teaching your dog the names of his toys and play a game of ‘go find pink bear’ with them. Once your dog knows the names of some of their toys teach them the “go find it” game. Have your dogs toys in a pile or container and tell them to “go find” their favorite toy. As your dog gets better at this game you can make it more challenging by increasing the number of toys they have have to sift through. Keep it fun for them by rewarding them handsomely with a treat or quick game of tug when they succeed. This game will give your dog a great mental workout. Does your dog know how to weave through your legs and jump through a hoop? There’s always a new trick you can teach your dog. 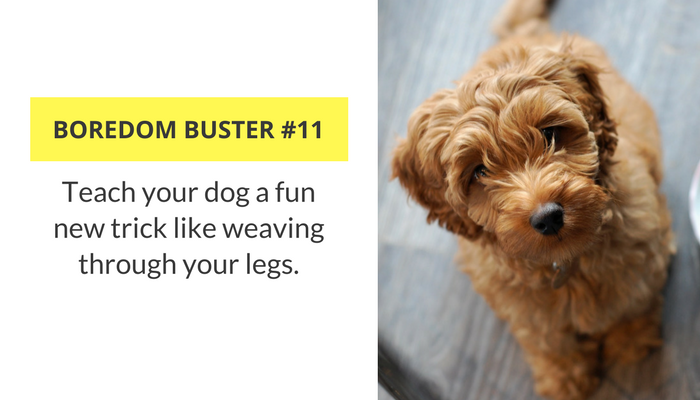 And teaching your dog how to weave through your legs is a lot easier than it sounds. Here’s a list of 52 tricks with instructions that you can work on. Once your dog knows a bunch of tricks you can step it up a notch and combine their learned behaviors into new tricks. Teaching your dog a fun new trick like weaving through your legs. If you don’t have a clicker I’d recommend picking one up next time you’re at the pet store. When training a dog every second matters; it’s so easy to miss the chance to communicate with our dogs the instant they do the behavior you desire. When you use a clicker you can mark the exact moment your dog made the right choice. If you’ve been thinking about teaching your dog some scent work games this is a great game to get you started. The only thing you’ll need is some dog treats, and if don’t any on hand you can use some chopped up fruits & veggies or make your own homemade dog treats. If he chooses incorrectly don’t discourage him, it takes a few tries to catch on. A gentle “touch” command will be helpful. Tip: Chopped up carrots make excellent treats for scent work games and training. They’re low in calories, easy to prepare, and (most) dogs absolutely love them. Playing a game of hide and seek is by far one of Laika’s favorite games. If your dog doesn’t have a good stay command down you can ask a friend to help by having them distract your dog as you go and hide. Keep you dog mentally stimulated by giving them a puzzle to solve. There are a ton of dog puzzle toys available, as well as treat dispensing toys like the Kong Wobbler. There’s also a ton of great DIY toys out there you can make. I love the simple muffin tin game – if you have a muffin tin and some tennis balls you’re ready to play. If you want to give your dog something to chew on for awhile we love Best Bully Sticks and Benebones. Just be sure to opt for odor free bully sticks if you’re sensitive to smells. Does your dog know all of the basic obedience commands? Does he have a reliable recall and stay? Even well trained dogs need a refresher course now and then to keep them sharp. All dogs should have a reliable sit, down, stay, drop it, and come here. A few quick training sessions (5-10 minutes) each day are a great way to help your dog master the basics, and they’ll help keep your dog mentally stimulated. 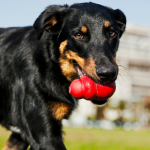 You can keep your dog interested in his toys by engaging in a game of tug or fetch. Most of us do have some extra room indoors for a simple game of fetch, but if you live on the 5th floor with a St. Bernard you should probably skip this game. When it comes to playing indoor fetch hallways, stairways, and big living rooms are popular choices. My dog and I love playing soccer in the basement with her Jolly ball. Be careful with heavy toys around anything that’s fragile or able to be tipped over, and it’s probably not a good idea to play fetch inside the kitchen. If you don’t like the idea of playing fetch indoors you could turn it into a simple game of catch. Learning how to give a dog massage is enriching for owner and dog alike. A nice massage can help soothe and relax nearly any dog. And dog massages are great for older dogs or those with arthritis, since it helps soothe sore and achy joints. Giving your dog a massage reduces anxiety, relieves stress, improves circulation, and creates a great bond between you and your dog. Tip: If your dog has a hard time settling down for a massage you can practice the relaxation protocol. If you haven’t heard of 101 things to do with a box you’ve been missing out on some fun training opportunities. It’s a great foundation for learning how to practice free shaping techniques, and it only requires a box and a clicker. The basic principle of shaping games is to encourage our dogs to try something new. They get to make their own decisions and increase their mental and physical flexibility. You start out with a box on the ground and without any cues let your dog investigate and decide what to do. Shaping can be used with any item, not just a box. Here’s a great video of shape training a dog to crawl under an object. Although your dog won’t find a grooming session as exciting as a game of tug it is something that needs to be done from time to time. Our dogs need to be brushed, bathed, have their teeth brushed, and have their nails trimmed when they start to get long. Some dogs tolerate grooming better than others, and the more you practice using positive rewards the easier it will become. Don’t be afraid to hand out lots of treats during a grooming session – you want to ensure your dog will associate grooming habits with a positive experience. Playing tag is a fun interactive game for dogs, but it does require a partner. Each of you will sit or stand at one side of the room with a toy or some treats. Take turns calling the dog over and rewarding them when he comes. Make sure your dog is receiving lots of positive reinforcement each time they obey. This is a simple and fun way to reinforce a reliable recall. Create your own obstacle course inside your home. Have your dog jump over some towels, weave through his toys, and then lay down on a blanket. Use your imagination and come up with a set of obstacles for your dog to follow. Once your dog has learned how to jump over the towels you then move onto the toy weave. Building on prior tricks will keep your dog mentally stimulated and encourages focus. Brushing up on dog tricks, making some yummy treats, and playing a game of fetch are all simple ways to keep your dog busy. This is my favorite activity to keep my dog busy when I’m under the weather. It’s such a simple way to keep my dog happy, entertained & exercised. I don’t know why but some dogs are fascinated by catching bubbles. There’s even a wide selection of pet bubble making toys on the market. You don’t have to go out and buy special bubbles either – the bubbles that are available for children are nontoxic. If you have a child in the home here’s some proof that babies, dogs and bubbles are the most adorable thing on the planet. If your dog has no idea what bubbles are here’s a quick guide on how to teach your dog to chase bubbles. And seriously, a few 3-5 minute sessions of chasing bubbles can work wonders for your dog. Studies have found that dogs get bored with their old toys. You can either buy your dog a new toy to get their enthusiasm going or you can rotate their toys. Instead of giving your dog access to all of their toys all the time give them a couple. If you rotate one of their old toys back into the mix after awhile they’ll have some of that original enthusiasm back. You can always make their toys more exciting by ensuring you’re engaging with them by playing fetch or tug. Toys take on a whole new value once you get involved and start playing with it as well. There’s also a ton of DIY toys you can make from household items such as old t shirts, towels, and denim. 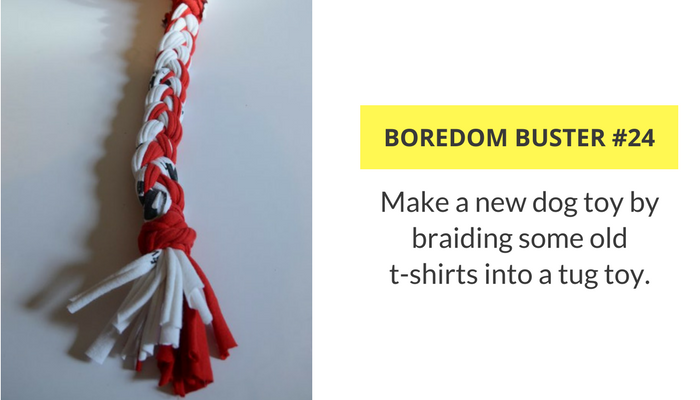 Make your own DIY dog toy by braiding some old t-shirts into a tug toy. Does your dog have some nice dog friends? Invite them over for some play time. It’s so satisfying to see dogs engaging in play with one another, and it’s pretty much guaranteed you’ll have one tired dog at the end of the day. You’ll also have a chance to catch up on some chores while the dogs create their own wrestle mania in your living room. Just like us our dogs can benefit from a refresher now and then. When was the last time you asked your dog to roll over or play dead? If it’s been awhile get out your clicker or treats and run through the drill. Have your dog practice all of their commands to make sure they’re not getting rusty. When it comes to training remember to keep it short & sweet; a few 5 minute sessions each day can do wonders. Before we go for a walk I have my dog go and grab her leash. She also has to fetch me my boots and her harness. It’s not asking much, but it’s enough to keep her focused and busy while I’m getting ready. Before I taught her to go grab those items she’d be spinning around, whining, and jumping while I got everything ready. This can come in quite handy when it’s getting late and you find yourself needing some more light and you’re feeling a bit lazy. Instead of having to get up and turn on the light have your dog do it for you. To start with this trick a touch stick or good “touch” it command are handy. If you have a small dog you might have to improvise to make it possible for your dog to reach the light switch. Don’t attempt this trick if the occasional scratch mark on your wall will bother you. Dogs, like children, have to be taught that they can’t always get what they want right away. From a puppy learning bite inhibition to teaching an adult dog to “wait” on command, impulse control keeps our dogs out of trouble and safe. Brush up on the basic impulse control commands like leave it, wait, stay, settle, and down. These commands are important if your dog ever gets loose or decides to chase after that squirrel. Instead of handing out a free meal have your dog perform a few tricks before they eat. Your dog might not be an active participant in the making of dog treats, but he’ll certainly be reaping the rewards. You can make your own simple dog treats instead of going out to the store. It’s nice knowing exactly what goes into what our dogs are eating. Not only will you have a great supply of training rewards on hand but you’ll also impress your dog with your excellent culinary expertise. Does your dog come up to you and nudge your hand when they want something? If you don’t find this behavior desirable teach your dog that sitting politely is the key to gaining your attention. Don’t be afraid to teach your dog how to act – without guidance they develop bad manners. Our dogs look to us for cues all the time, they like to know what’s expected of them. Reward polite behaviors handsomely, with consistency your dog will get into the habit of asking for things in a polite manner. After a nice training session or game there’s nothing better than a little bit of relaxation. We all need time to unwind, and many of our dogs love to lounge around with us. Before bedtime each night I sit on the couch with Laika for a bit. It didn’t start off as anything planned but now when 10:30 rolls around she hops up on the couch and looks at me – waiting for our nightly snuggle before bed. Being indoors doesn’t have to be dull. Play some fun games with your dog or teach them something new. Dogs thrive on interactive play, and it has a big impact on their overall health and well being. To keep your dog busy you don’t need a bunch of fancy toys or access to the outdoors, you just need a little bit of time and dedication. We might not be able to provide them with the full time job they were bred for – but we can give them something meaningful to do with a few simple games and tricks. And when you look at your dogs happy face after a simple game of tug you’ll know exactly why dogs are mans best friend. How do you keep your dog entertained indoors? Have you read about the recent studies that found a correlation between interactive play and a dogs well being? Does your dog know the name to all of his toys? Do you make your own dog treats or dog toys? 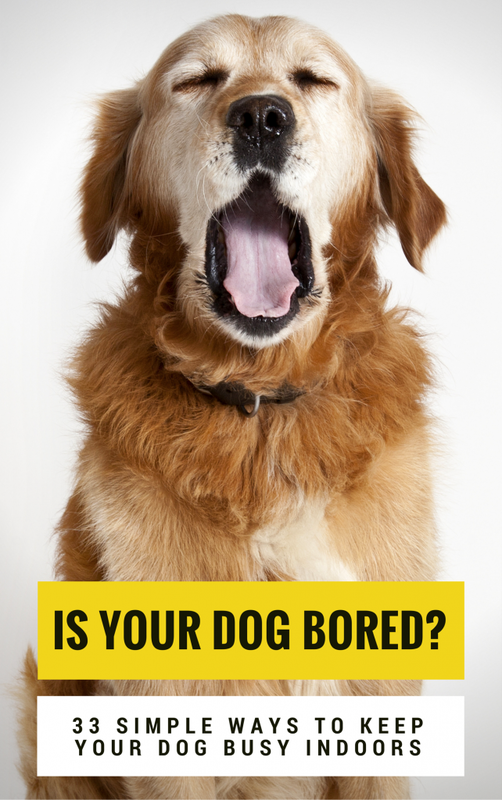 Does your dog look bored? 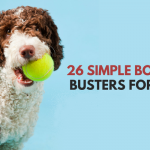 If you’re looking for more ways to keep your dog busy and entertained be sure to check out our list of easy ways to relieve dog boredom, how to keep your dog mentally stimulated, 5 quick ways to tire out your dog & 10 fun brain games to play with your dog. This post contains affiliate links, if you purchase an item I will earn a small commission. Great post!! We do a lot of these as my girls don’t like the rain! Wow, what a great list! There’s so much on here I never even thought of. This is an awesome list! There are several things I would like to try with Haley from the list and of course snuggling on the couch at night sounds pretty good too when it’s cold outside, lol! I’ve been wanting to train Haley to pick up her toys, but haven’t taken the time to work on that yet. I love snuggling at the end of the night; it’s one of our daily habits 🙂 I’ve kept all of Laika’s ripped up toys just for the sake of them having a name lol – we can still use them for training the go find it game. Wow – what a great list of activities – shared. Awesome tips! I love creating my own little games to keep the huskies busy indoors. It is wonderful for mind stimulation too. Excellent info! Thank you for the helpful suggestions. This is a good comprehensive list. We do lots of these and are big fans of food toys. Honey has been eating her meals from them since she was 8 weeks old. It guarantees a nice nap after breakfast. WOW! What a list! I think I’m going to have to print this out – what great inspiration to make things better for the dogs. And also thanks for the link! Very useful advices! Thank you! Hide and seek is definitely a favorite around here. I remember before we started playing that game I had my doubts – I just kept thinking “why on Earth would a dog like hide and seek?” Boy was I wrong, she absolutely loves it. These are great ideas, there are many I hadn’t thought of before. I look forward to checking out the 52 tricks link you provided! Thanks!! Fantastic ideas! And perfect timing…with these very hot summer days, our Siberian Huskies are tired of snoozing in the a/c! Sharing! What a great list! Sharing with clients. I love playing hide and seek with my dog; I think she loves it more! The perfect list of ways to keep a dog busy indoors, especially for winter and rainy days. Good list! We were looking for something to keep our puppy occupied when we couldn’t let him out in the yard due to weather. Found Mister Bat’s toy tether. It has been awesome. Wish they had more attachments though. You end up making your own, which still works great. I do #4 – use stairs and #7 – stuff Kong a lots but stuffed Kong is getting easier for them each time. Thanks for the list. Now we have to try something else! These should be great for a lot of the dogs I get in, but I currently have a 10 month old foster that gets bored with things easily unless it’s something he isn’t supposed to have. I try to play with him, but it never lasts long and he just walks away after a few minutes of training. This is a problem as I don’t always have time to take him on an hour long walk and he spends most of the day bored. the only thing that works for awhile is a kong. is there anything else I can do to keep him busy or increase his interest in play/training? I’m a huge fan of Kongs so I’m glad that’s working out for you. Do you freeze anything in them to make them last longer? That’s a simple way to get some more mileage out of it. I put treats in a pair of old socks, fold it like you would for your socks, and stick more treats in it. Then I throw it and my Goldendoodle plays with it and chews on it. He absolutely loves it! It takes him quite a while. Thanks for the great list! We do some of those with our dogs (snuggling on the couch every night is a given). Here is something else we do: our boxer LOVES it when we take out the laser pointer. She will chase that dot up and down the hallway until she is exhausted. Our rat terrier doesn’t really respond to it though. Great List! But as a dachshund owner, the “make stairs exercise” is kind of scary! I’ve been in the vet hospital from back pain from exhaustion from excessive stair use multiple times. I’m sure for larger dogs it is a great plan, but a disclaimer next to that activity might be great!! Great point, and it’s something I stopped doing with my dog Laika due to her arthritis. Please do not Use stairs to keep your dog busy. Stairs are not a healthy choice for pretty much all the breeds. Stay away from Stairs if you really love your pooch. There are some great ideas here for keeping dogs occupied. Keeping dogs active both mentally and physically is so important. The only one of those games i would be very careful playing is the dog catching bubbles game. My pup had a lovely time catching bubbles that one of my children got in a party bag when they were small and as the dog caught the bubble it popped causing a tiny amount of the liquid to go in her eye. The next day her eye was double the size and very oozy. Two eye operations and a huge bill later it turned out that the detergent in the liquid had done damage to her eyeballs and had irritated it so much she had to have a layer of her eye peeled away, eww. Only something like Johnson’s bubbles wouldn’t aggravate eyes so be careful. Thank you so much for sharing your story, that’s horrible. I think I took for granted the idea that most bubbles are gentle & safe. Wow thankyou for sharing the story regarding bubbles. I never knew. Most people just love their dogs. They are so special. I have a bullmastive, she’s 3 years old and hates the rain. She will smell the air an if there is a sprinkel, she most definitely does not want to get her hair wet. They are so smart more than a lot of people think. I lost my previous girl to cancer, never got over it. It eases the pain to have another love. Casey was born with ataxia an has hard time getting up on things but we loyally help her every day. She’s a trooper. She thumps the floor three times when she has to go out an potty. I never knew dogs could tell time but every day at 200 straight up Casey tells my husband time for a tummy rub. They go out on the covered deck sit on the couch an get tummy rub. I thought day light savings would mess up the time ????? Looks forward to it or else she pouts. Really enjoyed all those tips for activities, games and great things to do with your doggie. You can never have enough ideas when it comes to trying to entertain those little rascals. Brain games are the best! Thanks for sharing! Thanks for this article. Sasha, my very intelligent 16 lb mutt loves to go to the park, but it’s midsummer and I can’t take the heat! I’m looking for things to keep her occupied indoors. If I don’t, she will make up her own games and some of them are slightly destructive, lol. This is a life saver, thank you! Now I can leave the house for an hour without worrying that my pup will tear it all to pieces! Awesome and creative information! I always create my own little games to play with my puppy. Thanks for sharing ???? I am happy to read your post. Yeah, it’s really a tough task to keep a dog entertained. 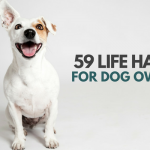 You have shared 33 awesome and simple ways to keep a dog entertained and busy. Most often I use to change my dog’s toys to keep him entertained and busy with his new toys. I love all of your tips and tricks. Thanks for sharing! I found this article looking for ways to teach my 11-month-old Pup how to entertain himself for a couple of hours. He loves the outdoors and I’m concerned about him getting restless and bored when the weather turns bitter cold, so I’m trying to plan ahead. We do a lot of activities listed here, but I also found some new ideas. Thanks so much. What a great list! Thank you for sharing! I hope my dog can learn all these tricks, it must be fun. I haven’t used it in the backyard, but I don’t see any reason why you couldn’t do it there as well. Great list. I am sure my dogs can learn all those tricks. I just need to be patient! This is a really precious info or tips. Quite a lot of them i never think about that. Sadly to say, due to the busy of work lifestyle, i only play fetch game with my dog (i mean the most favorite ones, beside there are other games as well). Patience is virtue, i think it need time before my dog can adapt a new games, not just fetch a thing. It is too common. Thanks again for the great list. Ok I have a one year old Great Dane he has a giant crate yes I hate crating him but I simply would not have a house left but he tears up his bed I will only leave toys he can’t eat in for him while I’m working but he tears up anything I put in for him to sleep on I just hate the thought of him being uncomfortable any ideas? Stuff that can’t hurt his tummy! I can’t think of anything besides crating that I’d be comfortable with in your situation. I crated Laika when I went to work for about the first year because I not only had to worry about what she might destroy, but I had to worry about whether or not she’d hurt herself by getting into something she wasn’t supposed to. The one thing I did leave for her every morning was a frozen stuffed Kong; those keep her busy for a long time. Yes I think I will purchase one of them I think if I can freeze peanut butter in them mayb he won’t destroy his bed!! Yes I hate the crate but it not only keeps him safe but my house safe as he is like three toddlers rolled into one!! Wow! This is a huge list. 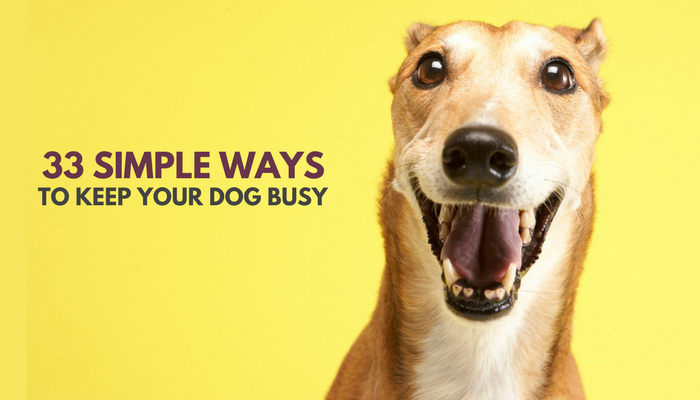 Lots of great ideas for keeping your dog busy. We use many of them ourselves. It’s winter now where we’re at and that means snow, so there’s plenty of time being spent indoors with our 2 mutts going stir crazy. Thanks for sharing! This is a good list! Definitely going to try some of these. We have 2 heelers. 1 is 9 and loves playing tug and the other is a puppy. Just turned a year old last month. I swear she is tireless and when she does sleep, she has 1 eye open. She is a super super smart dog (all heelers are) and would love the treat games. She quickly learned all basic commands along with shake and hi-5 by the time she was 9 months old. Hide and seek she would love but she never leaves our sides (LITERALLY have to run into the bathroom when she’s not looking and when leaving the house we have to leave slowly 1 ligament at a time before she starts her temper tantrum). When you have heelers, nothing is indestructible. We bought 5 of them when we got her and we are down to the last one (going in the trash tonight when she’s in bed as she keeps eating the rubber she bites off). They have such strong jaws. We CANNOT wait for the snow to be gone. The treadmill is boring for her and she is super restless even though she’s active all day. my dog can leap through a hula hoop now???????? This was such a sad post, made me cry 🙁 I hope I will never be in a situation to decide when the euthanasia should be done. I don’t think I would be able to handle it. I am a very sensitive person and i completely understand why you couldn’t be with your dog, even though you wanted to. Ever since my pup and I have moved into an apartment we haven’t had as much time to go to the park! So these tips have been amazing, and i thank you so much!! Thanks for the great list! I’m a huge fan of Kongs so I’m glad that’s working out for you. Stay away from Stairs if you really love your pooch. When i have moved moved into my job that time i haven’t had as much time to go to the park! So these tips have been amazing and i will must apply it from today hope so it will work for me. Thanks for the sharing. Love these ideas, although I will avoid showing the children otherwise they will all be trying to get Merrie to do their chores for them! Although she would probably do a better job! These tricks are amazing!! I can’t wait to teach my dog to grab his leash! I hang a large empty soda pop bottle (64oz) with the lid on tight from either a fishing pole, tree branch, or rafter to a height above my dog’s head that requires her to jump up to reach it. She tries to capture the bottle, but because it is full of air and the lid is on tight, this makes it nice and bouncy and challenging to catch. Katy loves to bump the bottle and make it fly off into the air so she can chase it. She will play this game non-stop until I either lower the bottle so she can catch it and enjoy her reward, or until she figures out how to capture the prize on her own. I use fishing line tied with a slip-knot so that when the bottle is caught, Katy can pull it right off the string and crush her prey to her satisfaction (I keep a supply of empty bottles on hand because after she’s done crushing the bottle, it goes into the recycling bin). The line is always kept up high so she never gets close enough to it to get entangled. This is a fun and safe activity, though I never let my dog play it alone. It’s her absolute favorite game and a great way to help her keep in shape! Play Interactive Games With Your Dog is the nice way to interact with the dog, by this the dog will get mentally stimulated.